Film DirectorThe name of illustrious film-director Mikhail Kalatozov (1903-1973) is one of the most recognizable brand names of Soviet cinematography. His famous film The Cranes Are Flying (1957), one of the most popular and unfading masterpieces of cinema, is remembered and beloved till date. 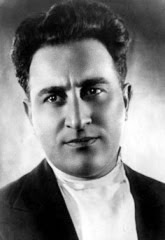 Sol Svanetii (1930) In 1928 together with N.Gogoberidze he directed Ikh tsarstvo (Their Empire) using news-reel materials. In 1930 Kalatozov made his debut in film-directing on his own with Sol Svanetii (The Salt of Svanetia) that became famous all over the world. After finishing a post-graduate course at the Academy of Art Studies in Leningrad (1937) and a short period of work at Tbilisi filmstudio Kalatozov was engaged as a film-director at Lenfilm Studio where he shot two movies about pilots Muzhestvo (Courage, 1939) and Valeri Chkalov (1941). The hero of the second film, the legendary Soviet ace Chkalov played by Vladimir Belokurov for many years remained not less popular among the viewers than Chapayev from the same-name movie by brothers Georgi and Sergei Vasilyev. Zagovor obrechyonnikh (1950)From 1943 Kalatozov worked at Mosfilm studio and represented Soviet cinema in Hollywood, in 1945-1946 he was at the head of Central directorate on feature film production, and in 1946-1948 he held the post of Deputy Minister of Cinematography of the USSR. During the late 1940s – early 1950s when not many movies were shot in the country, Kalatozov was granted the State Award (1951) for his film Zagovor obrechyonnikh (Conspiracy of the Doomed, 1950), a political pamphlet after the same-name play by N. Virta, starring the uncomparable Russian singer Aleksandr Vertinsky. However his true success of that period was his lyrical comedy Vernyye druz'ya (True Friends, 1954) (Grand Prix at the Film Festival Karlovy Vary), the characters and the style of which evidently bore signs of anticipation of the upcoming ‘Thaw’ epoch. Letyat zhuravli (1957) A beneficial influence of the ‘Thaw’ also marked Kalatozov’s major masterpiece, the war drama Letyat zhuravli (The Cranes Are Flying, 1957) (Grand-Prix at the Cannes Film Festival , 1958), innovative both in form and essence, after Viktor Rozov’s play Vechno Zhiviye (The Eternally Alive). With all its artistic system the film interprets the war first of all as a personal tragedy for two young people longing for love and life. The acting of the leads Tatyana Samojlova and Aleksey Batalov, brilliant montage and unusual mobility of the camera make this film an art work filled with great tragic power and subtle lyrical beauty. Neotpravlennoye pismo (1959) Inspired with the success of this film Kalatozov extended its imagery and drama finds to his next work, Neotpravlennoye pismo (The Letter That Was Never Sent, 1959), where the central plot collision is the death of a group of geologers searching for a diamond field. This film was followed by a philosophical and romantic poem of a film entitled Ya Kuba (I Am Cuba) (1964). Krasnaya palatka (1969) His last work was the joint Italian and Soviet production of the film Krasnaya palatka (The Red Tent, 1969) about the salvation of the polar expedition of Umberto Nobile. Besides reavealing the best features of the film-director’s creative personality (his gift in conveying the pathos of man’s feet, and the spontaneity of nature) the film starring Sean Connery, Claudia Cardinale, and Peter Finch became one of the most successful joint productions by Soviet and foreign cinematographers. Mikhail Kalatozov Mikhail Kalatozov died in Moscow on March 29, 1973. In 2000 “Mikhail Kalatozov Fund” was established in Russia as a non-commercial organization aimed at supporting and developing national cinematography, as well as keeping the memory of cinema masters of this country.